We continue preparing three pieces we have commissioned for their world premieres next week in the Bay Area: Mason Bates' "Sirens," Shawn Crouch's "The Garden of Paradise," and Tarik O'Regan's "No Matter." 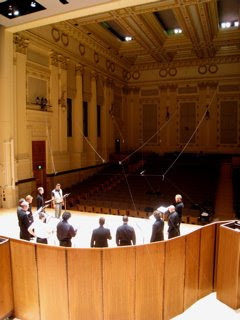 Today - Friday- trying out the new acoustical shell in the concert hall of the San Francisco Conservatory where we'll sing three performances next week. We'll also do it in Berkeley and Santa Clara.